This week we are showcasing Ranger Products. You don’t have to use them for the challenge but if you have them we would love to see them used. Here is my take on the challenge. I have generously splattered Black Soot distress oxide ink on the card front to add interest to the background of the card. 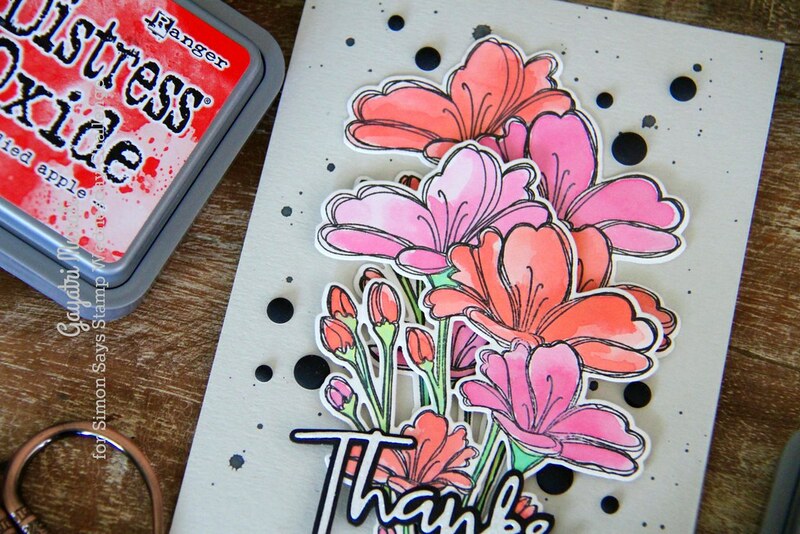 The flowers are from Simon Says Stamp Florals stamp set from One of a Kind collection released recently. I stamped them using Simon Says Stamp Intense Black ink on bristol paper and water coloured them using Ranger’s distress oxide inks. The inks I used are Picked Raspberry, Abandoned Coral, Twisted Citron and Lucky Clover. Love the chalky finish. The watercoloured cluster was then die cut using the coordinating die. I did couple of them to layer. On the card front which is Fog cardstock from Simon Says Stamp, I spattered Black Soot distress oxide inks generously. This adds visual interest to the background. 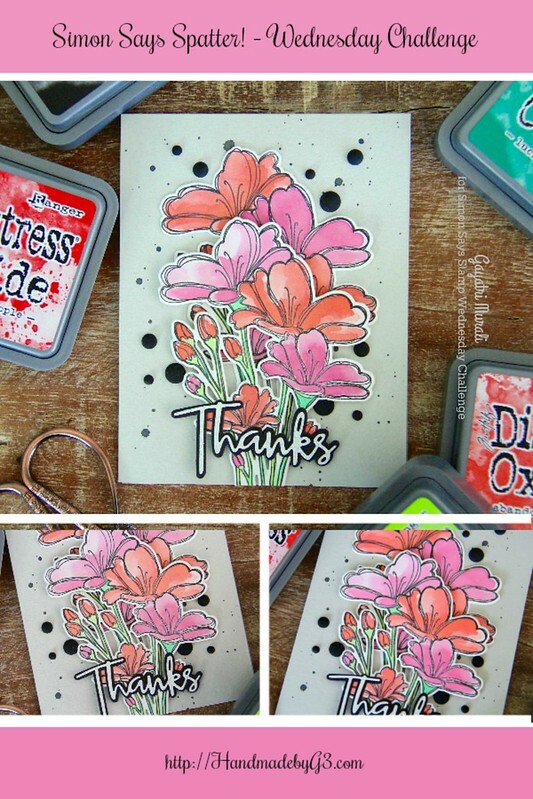 I layered and adhered the watercoloured flowers on the cardfront. The first using glue and the second using foam adhesives. 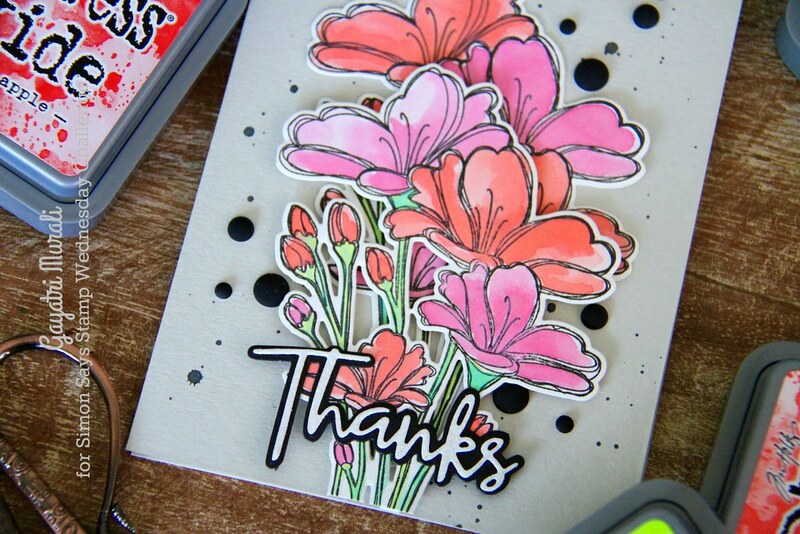 The sentiment is also from Simon Says Stamp Thanks die. I die cut the shadow die using black cardstock and the word die using white glitter paper and glued on top of the shadow. Finally embellished the card using matt black enamel dots from Your Next Stamp. I have used Ranger products to both watercolour the focal point as well as add interest to the background. Hope my card inspires you to make your own and participate in the challenge. So now it’s YOUR turn to splatter!! If you like to pin my card on your pinterest board, here is the photo. You really made this stamp shine, Gayatri! 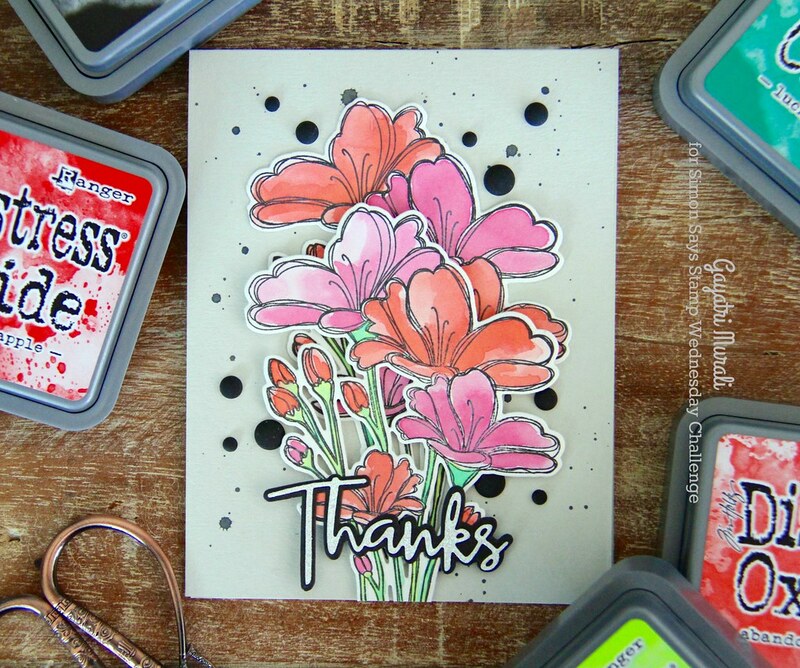 Taking note of your mix of inks……. Gorgeous design! The colors are definitely swoon-worthy, Gayatri!! Sending you big hugs and love! Thank you Gra O’ Neill! Gorgeous card, Gayatri! I love the bright palette and the way the black splatter with matte enamel dots really POPS! Love those inky colours together and the splatter is just a perfect detail. I am definitely going to try and use it more.